We collect the e-mail addresses of those who register for our email list, communicate with us via e-mail, make postings to our comment areas, and information volunteered by the user, such as survey information and/or site registrations. DallasDesignDistrict.com does not collect any other personal information that you do not expressly provide. DallasDesignDistrict.com may also request non-personally identifiable information, such as annual income, buying preferences, or age. Though this information is optional, we may use it to improve our site and/or tailor your experience on our site, showing you content that we think you might be interested in and displaying content according to your preferences. We may also share this information with others, such as advertisers interested in advertising on the site, in aggregate, anonymous form, which means that the information will not contain any personally identifiable information about you or any other person. In addition, DallasDesignDistrict.com may also collect non-personal, aggregated information about subscribers’ use of our emails and website. This information is not personally identifiable and will be used only to find out how subscribers use our service and site. For example, this information will tell us how much time users spend on the Lower Oak Lawn site, from which sites subscribers came, and to what sites subscribers go. In general, the information we collect is used for internal review to improve the content of our site, to notify consumers about updates to our site, used by us to contact consumers for marketing purposes, disclosed when legally required to do so, at the request of governmental authorities conducting an investigation, to verify or enforce compliance with the policies governing our Web site and applicable laws or to protect against misuse or unauthorized use of our Web site, to a successor entity in connection with a corporate merger, consolidation, sale of assets or other corporate change respecting the Web site. Occasionally, we may also use the information we collect to notify you about important changes to this website, or new services and special offers we think you will find valuable. You may notify us of your desire not to receive these offers by clicking the unsubscribe link contained in each such email. We will never sell, rent, or share your personal information, including your email address, with any third parties for commercial purposes without your express permission. DallasDesignDistrict.com may share your personal information for the purpose of delivering email to you or as required by law. 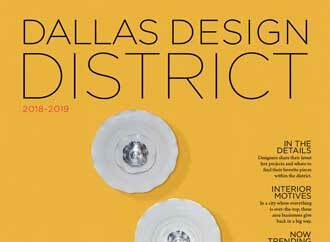 DallasDesignDistrict.com may provide links to third-party sites. DallasDesignDistrict.com is not responsible for the content that appears on these sites and does not endorse these sites. Please consult the sites’ individual privacy policies in order to determine how they treat user information.